26.2 Quest: Too hot for me today - and it showed! I was not able to get out to run till after 9:30 this morning and I knew it was going to be disastrous. The temperature at the start of the run was 84 degrees. It was humid, and yet still very sunny. The feels like temperature was 92 degrees. I hydrated well, put on some SCAPE Sunblock, and hit the road. If you haven't tried SCAPE I recommend that you do. SCAPE sent me some to try out and I have to say overall I am impressed. I did have a little trouble putting it on at first because it seemed to require a bit more for coverage than I am used to with other sunblocks. Once on I had the perfect test this morning with how well it would work. The SCAPE Sunblock did not run into my eyes just like it claims. I was sweating profusely by the time I got to mile 2 so if anything would run into my eyes that would be the time it would do so. I wiped my face quite a bit to keep the sweat out of my eyes, but one thing I noticed was no stinging at all. I almost always get some stinging in my eyes when I sweat this much, but this time I felt none. When I returned from my run, I could tell that my bald head, face, and arms were still well covered. I didn't get any burning at all and am confident how hot the sun was that I would have been feeling something by the time I got home. My run didn't turn out quite as well as I wanted it to. The heat and sun was getting to me by mile 3 and I knew it was going to be difficult to make it the rest of the way. After hitting the three mile mark I had to take a few breaks and walk some of the hills during that 4th mile. You can see the results of this in my running log. Yesterday my son Brady and I went to Six Flags. We are the smart type you know and we knew that with the temperatures around 100 degrees that the park wouldn't be as crowded and the lines would be shorter. Smart thinking on our part huh? :) After 9 hours on our feet, in the hot, humid, sunny, Georgia air, we were beat! We did a good job of hydrating throughout the day, but I think a day like that set me up for a run like I had this morning. My entire body was tired this morning. By the time I got home from the run the temperature and feels like temperature had gone up by 2 degrees to 86 and 94 respectively. Too hot for me!! Especially since I have mentioned before that I would much rather run in 100% humidity over the direct sun anytime. Tomorrow morning it is time for long run number 2 of marathon training...... wish me luck! Good luck with the long one tomorrow - hope you can get out there a bit earlier. Heat put a beating on me today too. With all of these positive Scape reviews I think I'm going to have to break out the credit card and give it a try. Tired of the Coppertone in the eyes. 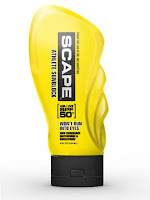 Tim, thanks for the review of the Scape Sunscreen. I was thinking about trying it myself, and so I'm ordering it online now. Hopefully, if I like it, someone will start carrying it locally. Thanks for the review! I am a new follower and have enjoyed reading your past posts. Anyhow, Scape sounds just like what I need here in the South. It was 95 degrees by 9:00. Just brutal. Be careful out there, this heat is ridiculous. Love Scape and I owe my kids a trip to 6 Flags as well...oh joy. Sunscreen is the missing component of my routine! I hope your long run went well and you stayed as cool as possible and well hydrated.